This is my easy cheats version of Spaghetti Marinara made with just a few simple ingredients, as Hubby always takes last nights dinner to work for lunch the next day this makes for a very easy friday night dinner as left overs aren’t required. I am usually making this for 2 adults & 2 kids, the kids mostly have just the pasta with tomato sauce and 2 or 3 prawns, so if you’re serving more just increase the quantities accordingly. 1 400g tin crushed italian tomatoes. Bring a large pot of salted water to the boil. When it’s boiling add the spaghetti and cook until al dente. (approx 12-15mins) Heat oil in a frying pan and add the garlic & onions and saute until translucent, add the tomatoes, rinsing out the tin with a little water and add that to the pan as well. 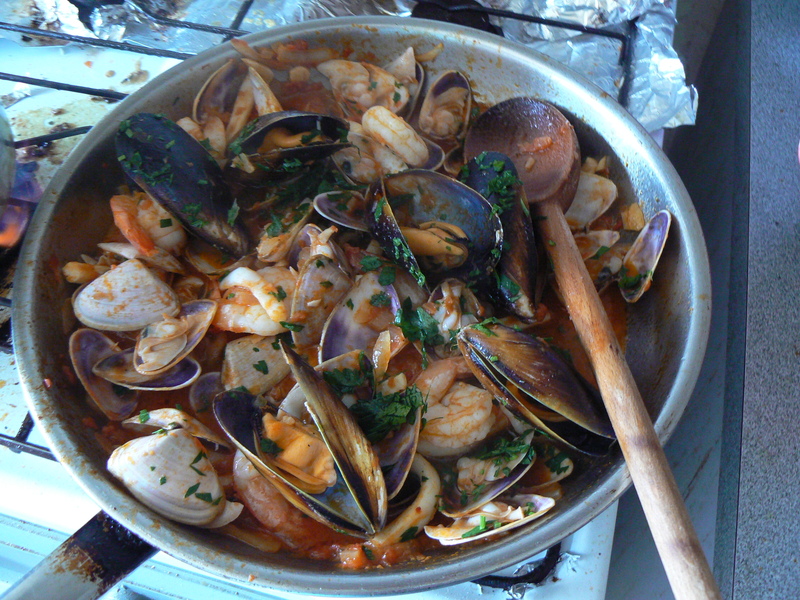 Bring to a simmer & allow to cook so the liquid is reduced and the sauce thickens, add the cleaned seafood and stir, cover with a lid (or oven tray as my frying pan doesn’t have a lid) and allow to cook until all the shell fish have opened. Discard any that don’t open as they could be off and therefore make you sick. Sprinkle with chopped parsley. Drain the pasta and either toss into the sauce or vice versa & Va bene dinner is served.